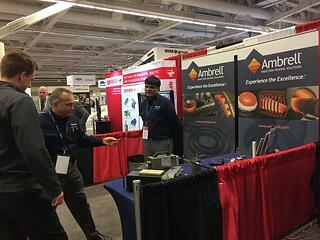 Ambrell, a leading manufacturer of induction heating solutions, will exhibit at MD&M East at the Javits Center in New York City. The event will take place June 13-15 and our representatives will be on-hand in booth 1866. We'll have an EASYHEAT on display and an applications engineer from THE LAB will be available to discuss customer applications. Additionally, MAX by Ambrell, the world's first induction heating cobot, will be on display in Universal Robots booth 2529 in the ATX East section of the event. A collaborative robot or “cobot” is a programmable machine that performs a variety of light industrial tasks, usually repetitive tasks, and interacts safely and efficiently as it works hand-in-hand with humans in a shared process. MAX is an innovative induction heating solution designed to maximize manufacturing throughput. MD&M East – now in its 34th year – is the largest medtech event on the east coast, connecting attendees with thousands of engineers and executives, as well as hundreds of leading suppliers. MD&M East runs alongside five additional advanced design and manufacturing trade events, providing access to a full spectrum of solutions in one end-to-end experience. To see when Ambrell is coming to a tradeshow near you, visit our events page.